Alistair Hall developed a company-wide strategy to advance sustainability and energy management at PCC Markets’ existing stores, while also setting targets and guidelines for new store design. Grocery stores are some of the most energy intensive buildings in the country. They operate commercial kitchens and run large refrigeration systems 24/7. 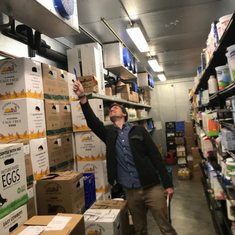 Mindful of their energy expenditure, PCC Markets enlisted EDF Climate Corps fellow Alistair Hall to evaluate their sustainability efforts and chart a trajectory for efficiency and green building standards. PCC sought to ensure that as they open new stores, their commitment to sustainable operations remains as important as their commitment to expanding the organic food supply chain. Hall analyzed PCC’s utility data and conducted store audits to develop a portfolio of projects aimed at energy efficiency, water conservation and employee engagement. Compared to carbon dioxide, refrigerants are thousands of times more potent greenhouse gases. Learning this, Hall supported efforts to create a preventative maintenance program and worked with the team to refine their strategy for retrofitting existing refrigeration systems to use more environmentally friendly refrigerants. The energy efficiency, employee engagement and green building guidelines proposed all fit underneath PCC Markets’ overall Environmental and Social Responsibility commitment. The recommended projects will save more than 1,100,000 kWh, 400,000 gallons of water and 34,000 therms of natural gas. Together this represents almost a 10% reduction in PCC’s total energy usage across their 10 stores. A revised green power purchasing program will offset more than 4,468 tons of carbon. Green building standards for store refrigeration systems will eliminate harmful HFCs and prevent the potential emission of hundreds of tons of carbon per year. Alistair Hall is currently pursuing his MBA in sustainability management at Bard College. As the Sustainability Coordinator at Vassar College, he leads initiatives on energy efficiency, community engagement, and strategy. His research and policy work has centered on innovation in green building design, supply chains and carbon pricing.